My name is Amanda Ngabirano, and I am a married mother of two and a passionate cyclist. Both my daughter and son are bicycle lovers like me. I am bold and ambitious and I love my country Uganda as well as my continent Africa. I truly wish there were more opportunities for my brothers and sisters in Africa to cycle more, especially in their cities, without any fear or stigma. I am an urban planner, trained in my home country and abroad. I also teach at Makerere University and am fortunate to have a profession I love. I am passionate about organized spatial development and I also act as a local partner for Move Mobility, a Dutch-based organization. My mission is a bit selfish because I would like to ride more in my city, Kampala, with my family and the others, including, women, children and the old. I would like to see lots of safe cycling infrastructure especially because I know how difficult it is currently. I dream of seeing my city keep the current cycling population as well as attract more. Well, I have been called a dreamer, since I discovered my passion for cycling and working hard to make it a reality in Kampala. But every great dream begins with a dreamer. I am dreaming of my Africa with safe cycling infrastructure for her future: where all can freely choose to ride somewhere, when they want, where our children will stop riding in our houses and compounds, but get on streets and remain safe from traffic cruelty; streets where children, women and the elderly will smile as they move, streets with better air quality, streets where men will safely pause and admire their healthy, happy and free families as they move, and be proud of where they belong and live; I am forever dreaming of free streets, free neighbourhoods, happy and united people. 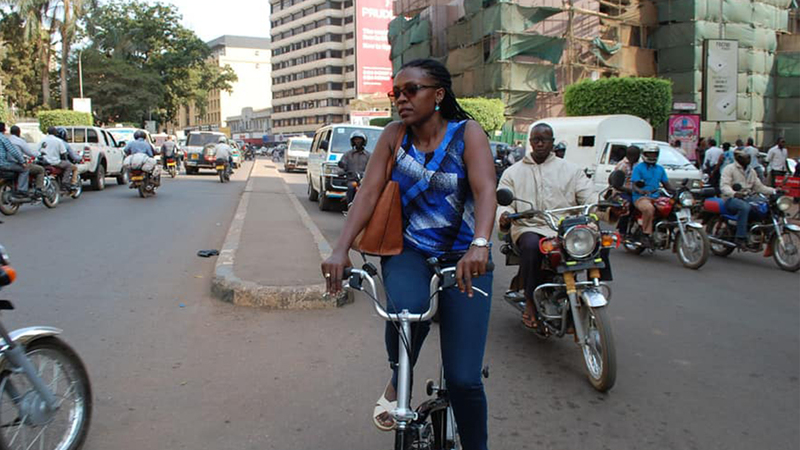 I am dreaming of a cycling Kampala, where safety is guaranteed. We can cut so much on transport expenditure if we respected and planned for cycling and gain in many known ways. The biggest challenge is traffic mix and lack of cycling infrastructure (lanes and parking), and that cycling doesn’t look entirely normal especially when people like me choose to ride in our city. The attitude isn’t right. I will build onto what I have been doing as a passionate individual and as WCA Vice President, in Africa. But I will also broaden my network in order to initiate meaningful partnerships so that the cycling agenda can be pushed to a deserving platform. I intend to approach the national and city leaders about the possibility of building onto some achievements so far; for instance we are happy to have a non-motorised transport policy, which is quite clear regarding planning for safe bicycle infrastructure. The city leadership has also taken a smart step to pilot cycling inclusive designs in selected zones, and so I intend to continue working closely with them to take more such steps. We can’t brag about cycling infrastructure but we can brag about how we still have a great human eye contact in our traffic situation. This is how cyclists survive….road users here use so much eye contact/communication to make decisions as they move. Also, Kampala has started the process of cycling inclusive planning, why can’t any other city start too?